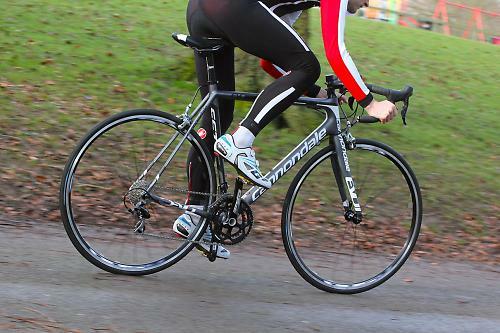 The Cannondale SuperSix Evo 6 105 may be the cheapest SuperSix Evo in Cannondale's 2014 range, but it offers much of the speed, handling and performance of the more expensive models higher up the Evo line-up. At £1,699 it's the most affordable SuperSix Evo the company have offered since the model was first introduced in 2011. Back then you needed deep pockets or a pro contract to get your hands on one. To now be able to get such a high calibre race bike at well under £2,000 is impressive, and you get a build kit that, while not flashy, does the job well and doesn't hold the frame back from delivering its full potential and high-class pedigree. To all intents and purposes this SuperSix Evo pops out of the same mould as the more expensive Evo frame. It's even using the same Ballistec carbon fibre used higher up the Evo range, but rather than the expensive high-modulus carbon weave of those bikes, intermediate-modulus carbon keeps the price down. Yet weight is still competitive at a claimed 950g (size 56cm), not just for a bike in this price range, but against those costing much more. Carbon layup differences aside, there are some subtle changes. The main one being the external routing of the rear brake cable, rather than the internal routing of the expensive Evo frames. 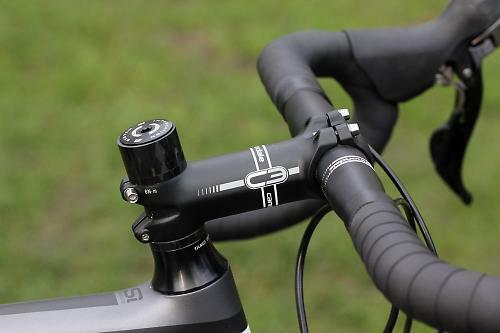 This adds a bit of weight in the addition of the cable stops, but reduces assembly time which contributes to the lower price Cannondale are able to sell it for. It's also better from a servicing point of view. The gear cables are the same externally routed as the rest of the Evo range. The external cabling does mean the frame isn't Di2 compatible, but if you're eyeing up this bike - Cannondale are figuring - it's unlikely you'll be planning such an upgrade. Visually, the frame is all but identical then. There's the same tube shaping, a wide oval top tube that contributes to the frames stiffness, an oversized down tube and large chainstays. The head tube is tapered - 1 1/4in to 1 1/8in bearings – but with a smaller diameter lower bearing race than most race frames. While it's not an aero frame, Cannondale did consider the passing of air over the frame to a degree, and tackle the issue of drag with a skinny head tube reducing the frontal area. The 315g fork is all-carbon, the steerer tube included, and has narrow fork blades to improve aerodynamics a little. The main tubes are also very straight; you don't find many superfluous curves or shaping on this frame. The top tube is almost horizontal, with just a smidgen of slope. Out back the skinny SAVE seatstays provide impressive comfort when the tarmac gets broken and choppy. It's a smart and perhaps conservative looking frame, but importantly it still looks as good now as it did when it was first introduced several years ago. It's aged well has the Evo. To build the frame it is constructed in three sections. The head tube, top tube and down tube are made as one piece, and then bonded to the seat tube and bottom bracket - made as one part - and seatstays and chainstays - also made as one section. The top tube is a wide fat shape, slimming in the middle and creates an unusual junction with the skinny seat post, which accommodates a 27.2mm seatpost. The down tube is round throughout its entire length. Pleasingly, Cannondale decided against altering the geometry of this cheaper Evo, so it's the same as you'll find on the £8,500 Black Inc. That means a 73.5 degree seat and head tube angle, 99cm wheelbase and 55.8cm stack and 39.5cm reach on the 56cm I tested. One of the most important figures to pay close attention to if you're interested in the Evo is the head tube height, for at 15.5cm it's properly racey. That may suit you, it may not; I found it bang on perfect for the sort of riding I like to do. Cannondale do fit a generous stack of spacers and there's a tall headset cap on there, so from the box it's not that slammed, but easily could be if you wanted. This is designed as a race bike remember, so you're getting race bike geometry. If you want higher and more relaxed, the Synapse is probably the bike for you, with its taller head tube and shorter top tube. Cannondale offer two Shimano 105 builds, one at £1,850 with most of a 105 groupset and RS11 wheels, and this £1,699 model which saves a few pennies with Tiagra brake calipers and 12-28 cassette and an FSA Gossamer 50/34 compact chainset. There's nothing intrinsically wrong with those substitutions; the brakes work well enough, though do lack the easily removable brake blocks and have a hint of flex when pulling hard. The FSA Gossamer chainset is used simply because Shimano don't do a BB30 chainset - all Evos use the 30mm bottom bracket spindle standard that Cannondale developed and made freely available. I had no complaints with the transmission. 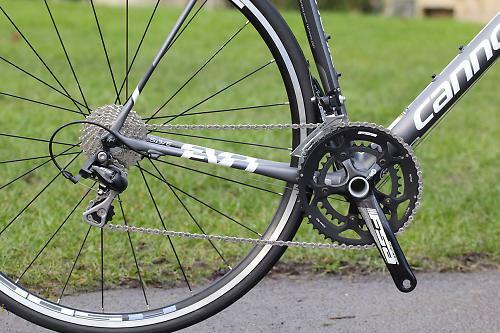 The FSA chainset offers decent stiffness when pushing hard on the pedals, and shifting performance was good. The 50/34 chainset combined with the 12-28 cassette makes winching up steep hills as much of a doddle as can be expected when you're relying on your own fitness to propel you up the hill. 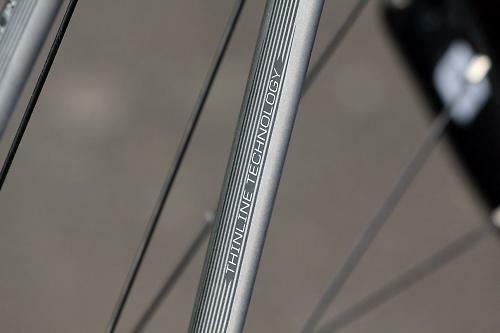 Wheels are Shimano's R501 model, a reliable wheelset that while not the lightest did prove to be solidly durable in testing, surviving a few puddle-concealed potholes during testing. 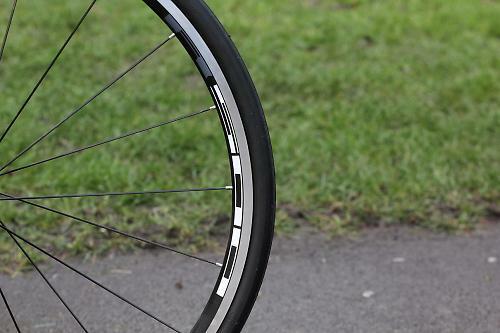 The next up Evo gets slightly better RS11 wheels which might tempt you to save up a bit more for that bike. The wheels are fitted with Schwalbe Lugano 23mm tyres. They're the German tyre company's cheaper model, but while not particularly light or offering the best tread compound, did provide reliable levels of traction in a range of conditions and didn't cut up too badly at all. 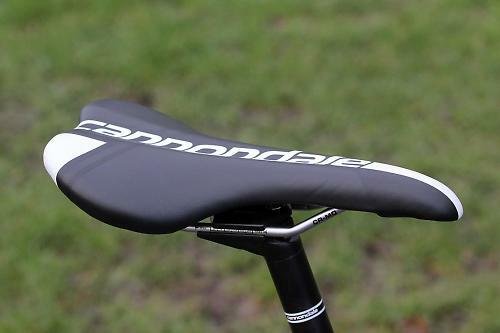 Cannondale fits its own C3 branded handlebar, stem, seatpost and saddle. It's all decent stuff, not great to look at, but performs just fine. Handlebar width is a personal issue, but I personally found the 44cm bar a bit wide, I do prefer a 42cm. That's something that could easily be changed though, and you may not find the width an issue. The bars have a pleasing shape, with a nice curve when riding in the drops. I changed the stem for a 12cm one, but you might find the 11cm standard just fine. I don't always get on with saddles that look like the one fitted to the Evo, I'm a bit fussy if I'm honest, but I must admit to finding this one pretty comfortable. So, the ride then. I've spent some time on the hi-mod Evo and I was pleasantly surprised with how just familiar this £1,700 Evo was to ride. I felt right at home. On paper I thought the 8.5kg weight might hold it back, but that wasn't the case; it simply flies along the road with fabulous speed. It's not just quick for a £1,700 bike, but properly quick regardless of price. Clearly, lighter bikes will offer better acceleration, but the Evo just felt so willing and capable I really didn't find myself ever lacking the ability to go as fast as I wanted. The handling is pure race bike stuff, low at the front and stretched out, just the way I like my bikes. It encourages you to ride the Evo fast, and it's perfectly capable of belting along the road, attacking summits and climbs, diving into corners and hurtling downhill. Changes in the direction are handled with a swiftness from the handlebars but it's a very predictable bike to turn and steer. It's an easy bike to ride, and throws up no unexpected surprises. That a race pedigree bike can be so easy to ride is quite impressive. Climbs showed the bike to ascend quicker than the weight suggested it might; it'll have you out of the saddle hurtling for the summit. It eggs you on, urges you to ride fast. Even at sedate speeds when you're just out to enjoy the thrill of cycling and not worrying about speeds or segments, the Evo is perfectly comfortable. It may have the DNA of a race bike, but it sure makes a fine cruising and sportive bike. You could ride it all day and still be fresh when you finish. The ride is a tiny bit more harsh than the hi-mod Evo, a difference that is to be expected considering the difference in price. But there's no reason to fear you're being short-changed with this Evo, the differences are very minute, you'd need to ride both bikes back-to-back to notice. I was able to do just that, but I wouldn't say the cheaper Evo lacked as much as you might imagine in the performance and comfort stakes. Despite its race bike label, it's pleasantly accommodating of any rider no matter the fitness or experience level. It's an ideal choice if you want to get into road and crit racing, and want to bike that can accommodate your growing ambitions. 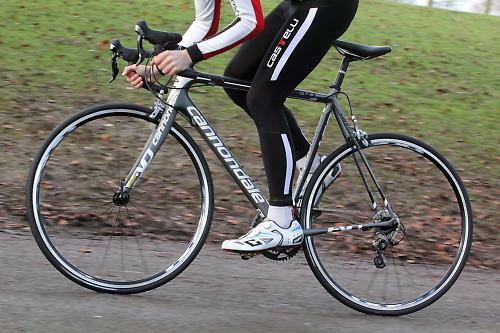 If your thing is sportives or simply riding hard every Sunday, the Evo is a belting choice. There's a real gem of a frame at the heart of this bike, and happily the build doesn't prevent the quality and performance from shining through. It's a gem of a bike this. I tried hard to peel back any blemishes or concealed flaws with the Cannondale SuperSix Evo 6 105, but try as I might, I simply enjoyed every outing on it. Riding the Evo makes you feel fortunate to be a cyclist. It may not have the glitter and bling of a more expensive Evo, or any of its rivals, but the bike is a charm to ride, and it won me over every ride. Make sure it's on your shortlist if you're in the market for a sub-£2,000 road bike. Cannondale's most affordable SuperSix Evo offers a stunning ride for the price. It's a gem. 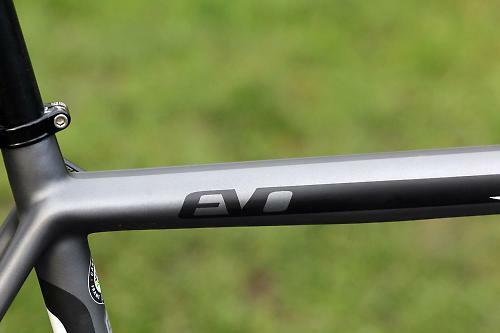 It's cut from the same mould as the pro level Evo, but standard carbon keeps the cost down. The geometry produces pleasingly predictable handling. It's low at the front which will suit some people, it certainly suits me. Yes, those skinny stays and the 27.2mm seatpost does a superb job of filtering out road buzz. Despite its incredible comfort, it's still plenty stiff enough in the right areas for some very earnest riding. The handling is the Evo's trump card really. It's happy being flogged around crit circuit but equally at home in a sportive or just a lazy Sunday ride. The components all worked well and caused little complaint. There is a lot of choice vying for your hard-earned cash at this price, with similar bikes that used to be only available at the very top-end now much more affordable. In the changes to the carbon fibre layup and the external cable routing, little of the essence of the SuperSix Evo Hi-Mod has been lost. Yes, if you want to split hairs there is a difference in ride feel, a little lack of stiffness when applying the power and not quite the same level of comfort, much of which can probably be attributed to the wheels and finishing kit rather than the frame. All in, this cheapest Evo represents a seriously tempting option for anyone looking for a £1,700 bike and wants something that can be road raced, used for sportives otr just ridden hard. 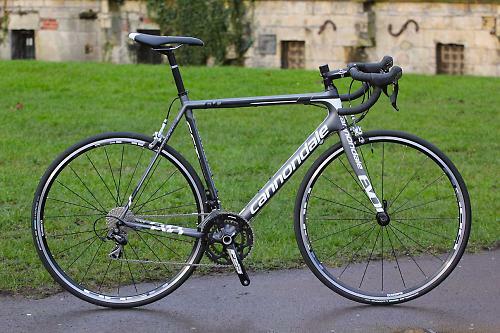 Cannondale has put together a cracking bike. Considering its got smaller tubes than the old supersix 105, where does the extra 500 grams weight come from? Wheels or finishing kit clearly, as the frame is 950g. This one is on my List to replace my CAAD8, although I think the Synapse is more me (I'd rather have a slammed Synapse than a S6E with a pile of spacers). I do worry that a lot of people will look at the weight and go buy a Canyon though. Any idea how much the fitted wheels weigh? I know what you mean - I run a Trek Madone with 1 spacer rather than go with a racier geometry and stack it up. Any idea how much the fitted wheels weigh? 1848g is the official figure, skewers probably run at around 150g on top of that. I'd guess 2100g all in, if you're lucky. Must be in the wheels then. My supersix is about 8kg with Aksiums and the same C3 finishing kit. Lovely bike though. I love mine. For the Mr Beans out there. Just wondering, with regards to the differences from Evo's higher up the range, are you talking about the Hi-Mod? Is this the same frame on the higher spec'd Evo's that aren't Hi-Mod? 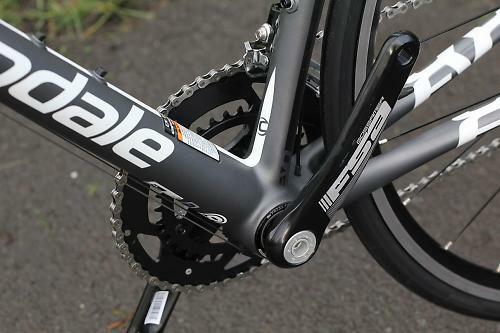 Black Inc is Evo Nano, Uber exclusive, weight well below UCI limits. Evo SM external brake (standard mod) same mould, same SM carbon, externally routed brake cable to save a couple of $'s. In a nutshell, this comes out of the same mould as all the Evo's, is the same performance as the SM frame that can retail as a bike up to nearly £4K, the only difference is the external cable. Thanks for the info' Gossa - appreciated. I think I "could live with" the external cable routing, lol! I've just got this bike in the largest size - 63cm - it's an absolute joy to ride.